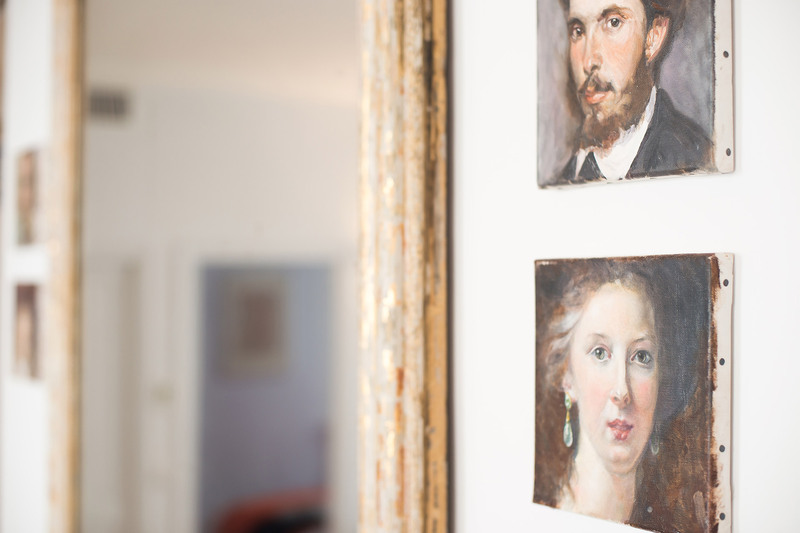 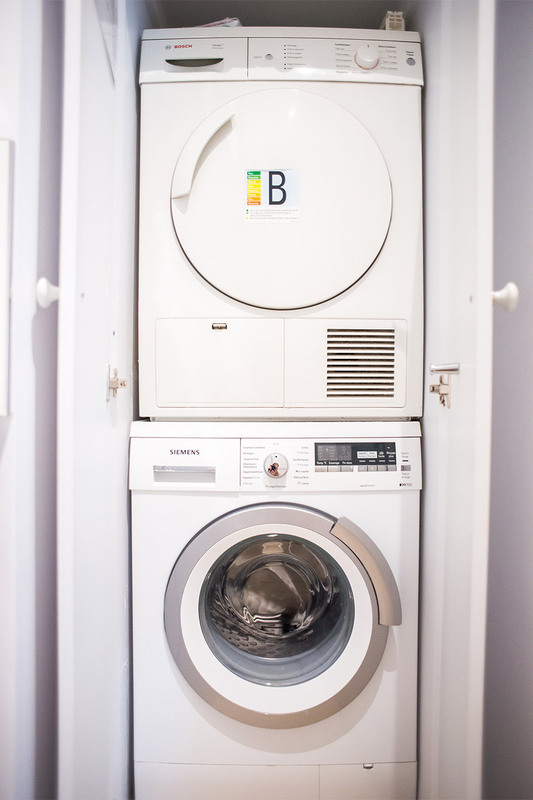 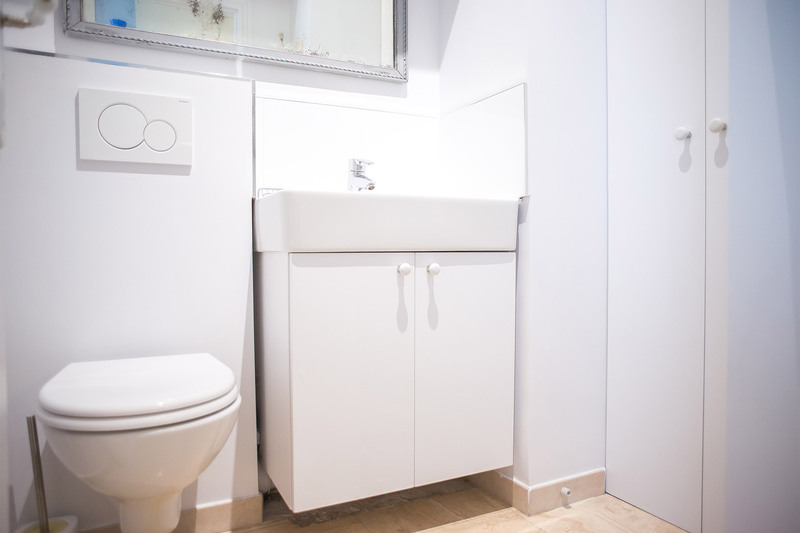 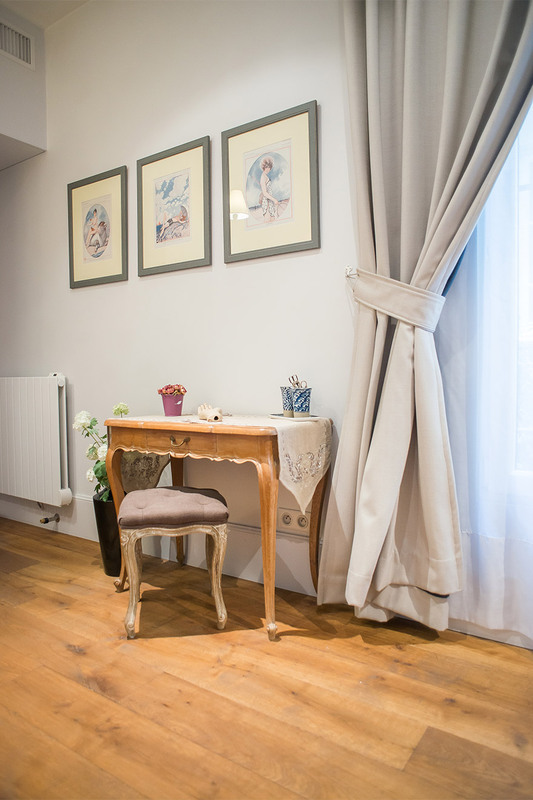 The bright and stylish two bedroom, two bathroom Bel-Air rental is set in the desirable Marais and is a wonderful home base for exploring this artistic and lively neighborhood. 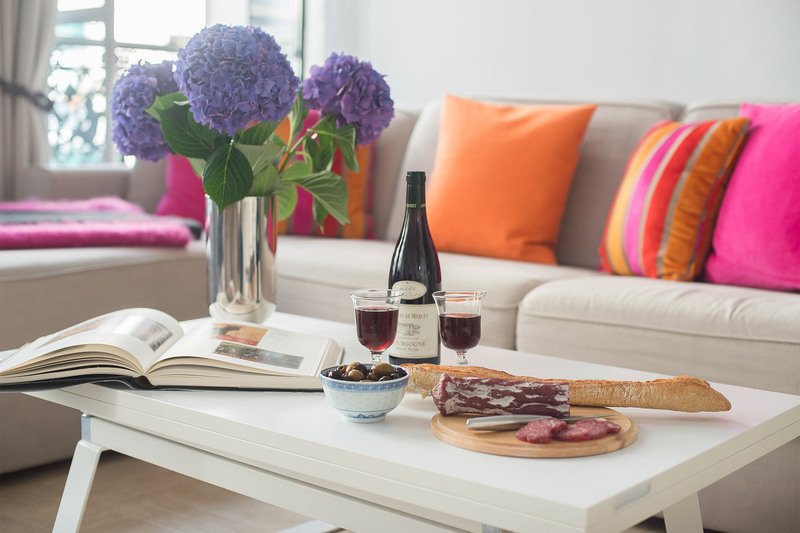 This apartment takes its name from a favorite Château Bel-Air red wine produced in the prestigious Lussac Saint-Emilion area of Bordeaux. 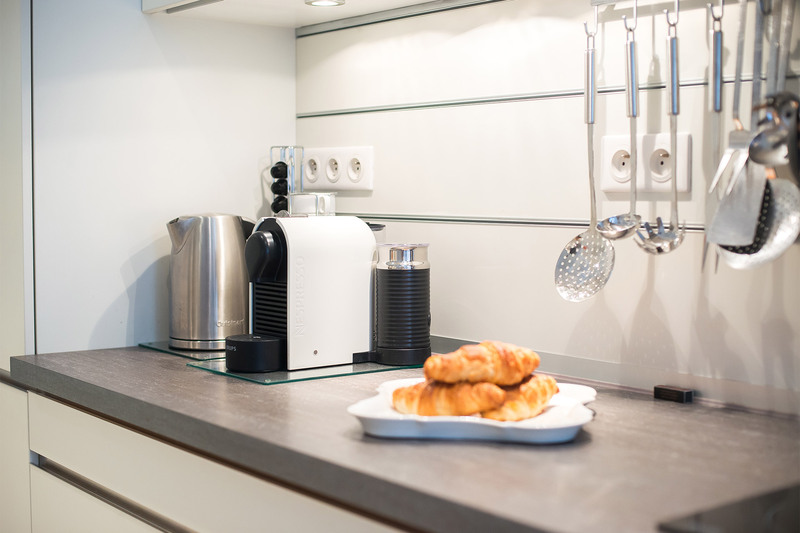 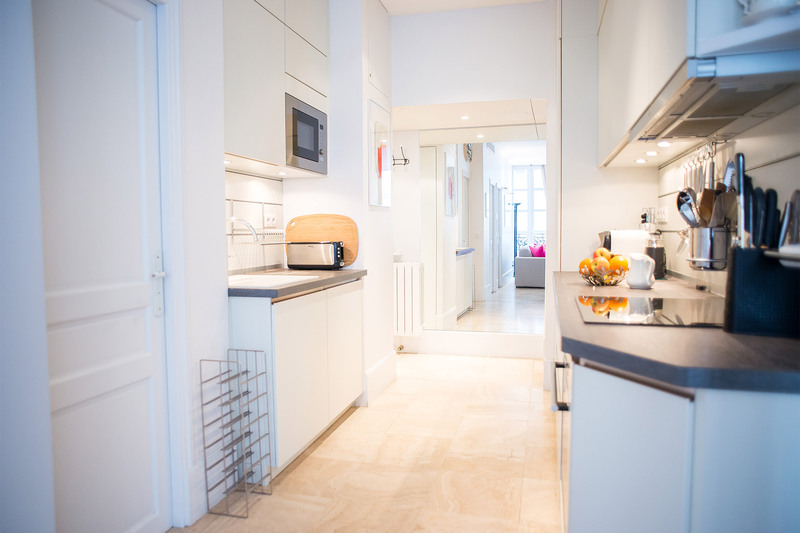 Step into the apartment and walk through the efficient and fully equipped kitchen to the large living and dining room. 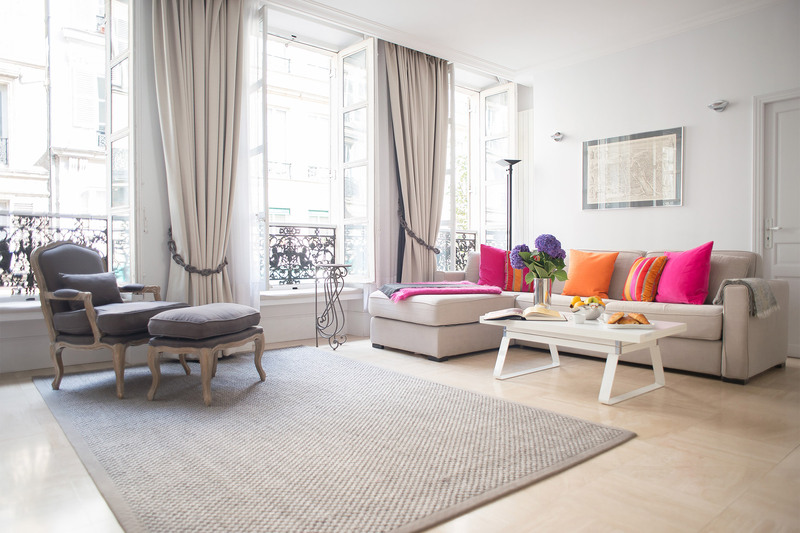 Light pours into the inviting space through three sets of French windows, and the open plan design allows for comfortable living and easy entertaining. 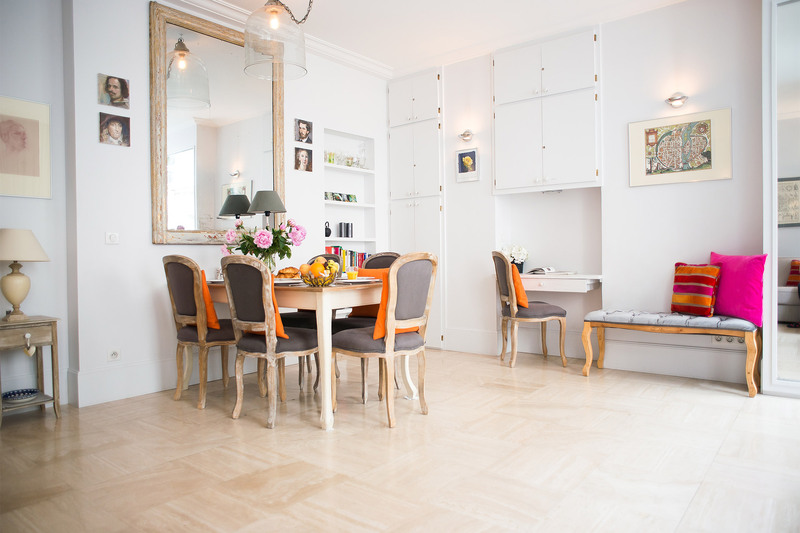 The dining table seats up to six people and can be set up in the middle of the room for dining together with family and friends. 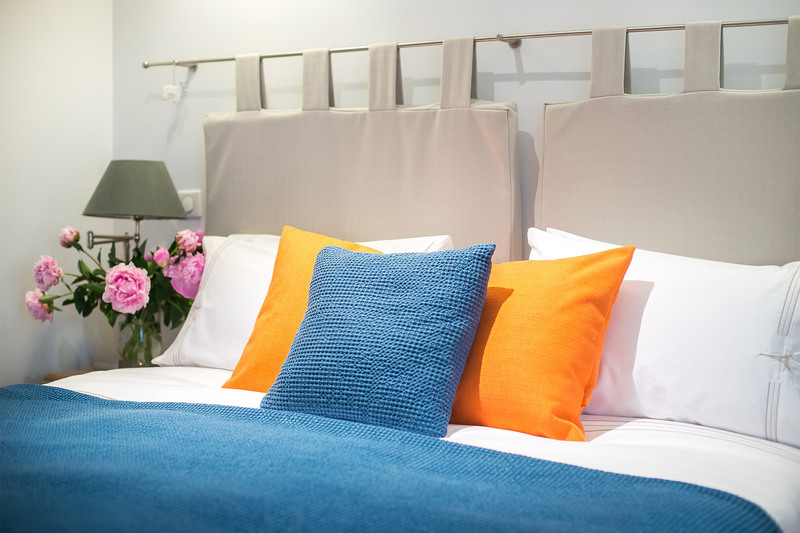 At night, the sofa converts into a comfy double bed with a fantastic memory foam mattress. 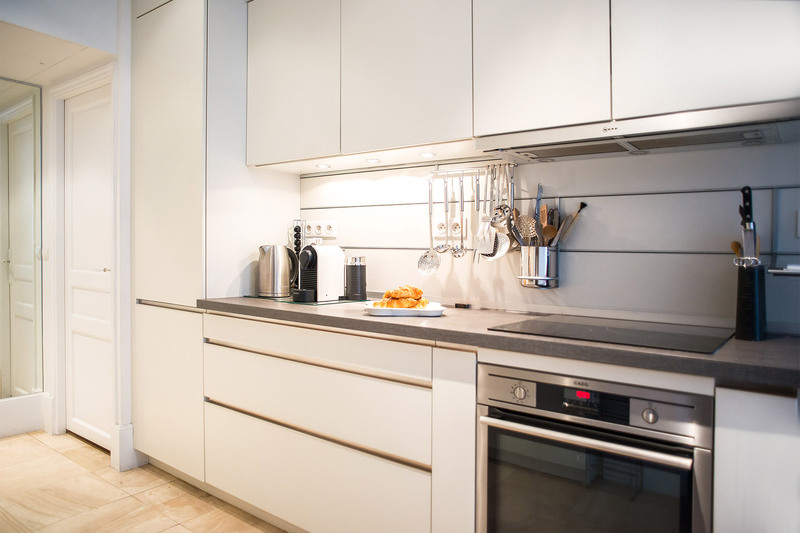 For privacy, there is a sliding door that separates the living area from the kitchen. 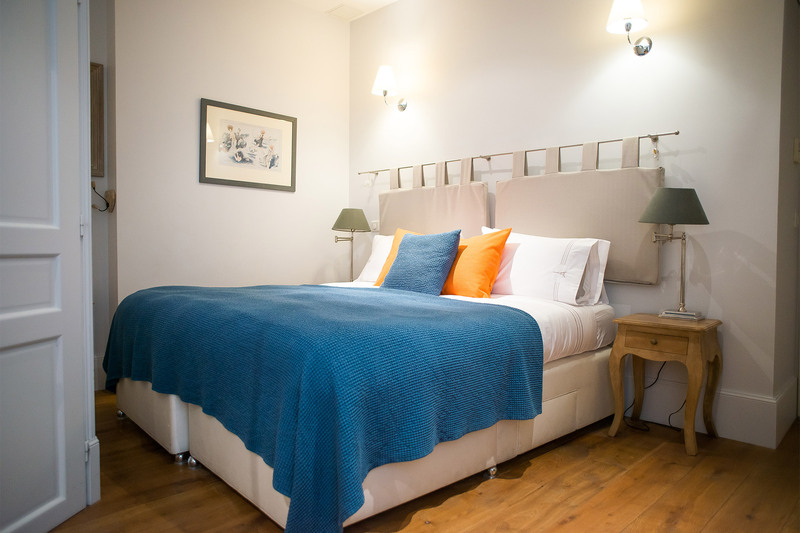 The master bedroom is a fantastic refuge with its quiet location, extra-large bed and en suite bathroom. 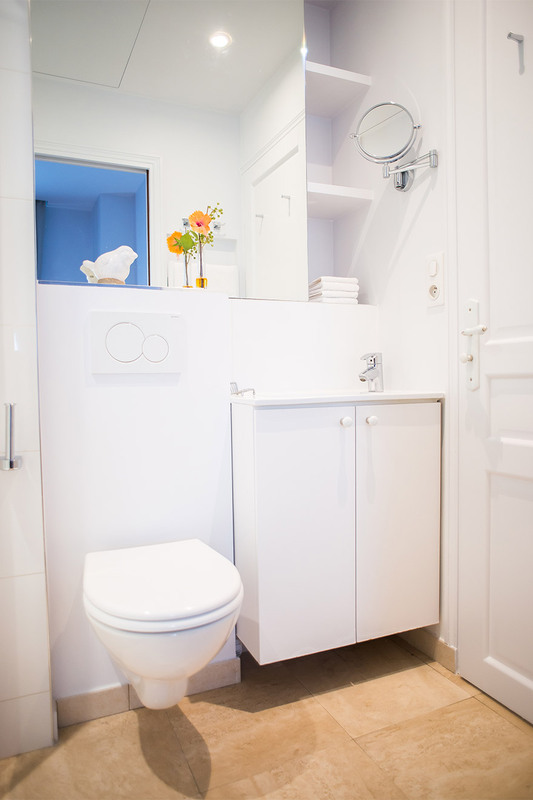 The second bedroom is located off the living room and connects to the second bathroom. 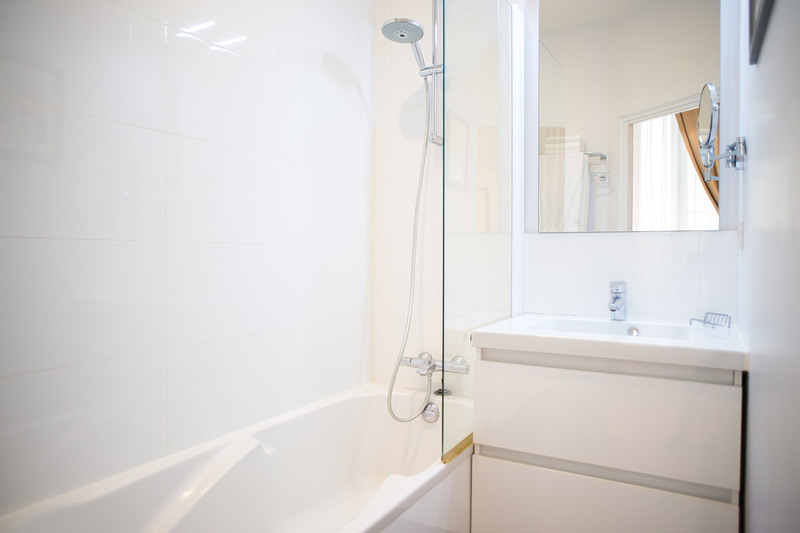 The second bathroom is also accessible via the living room and a separate half bath is located just next to it for added convenience. 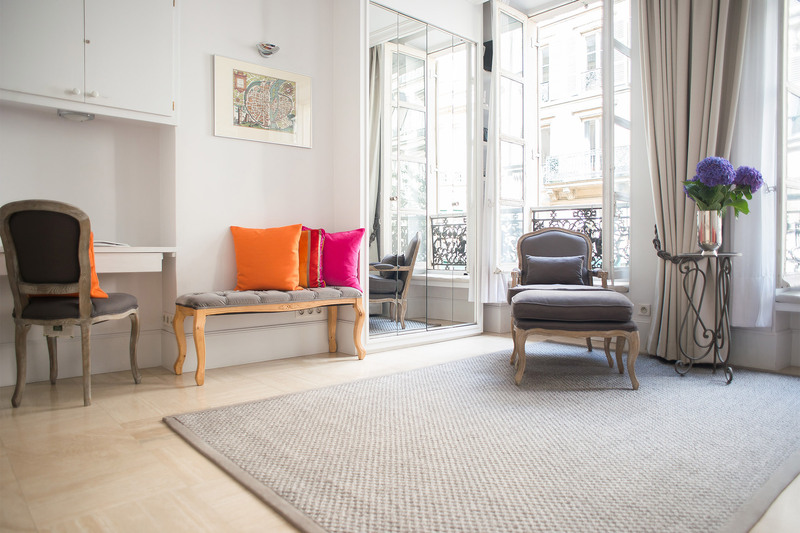 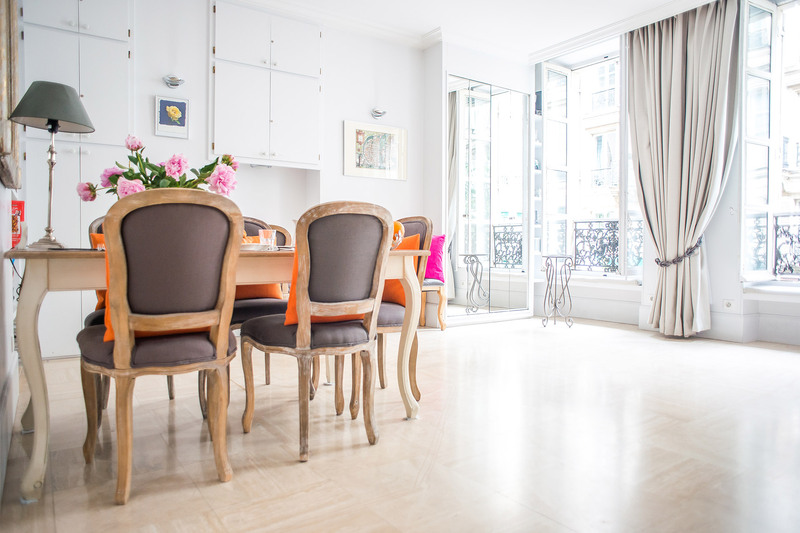 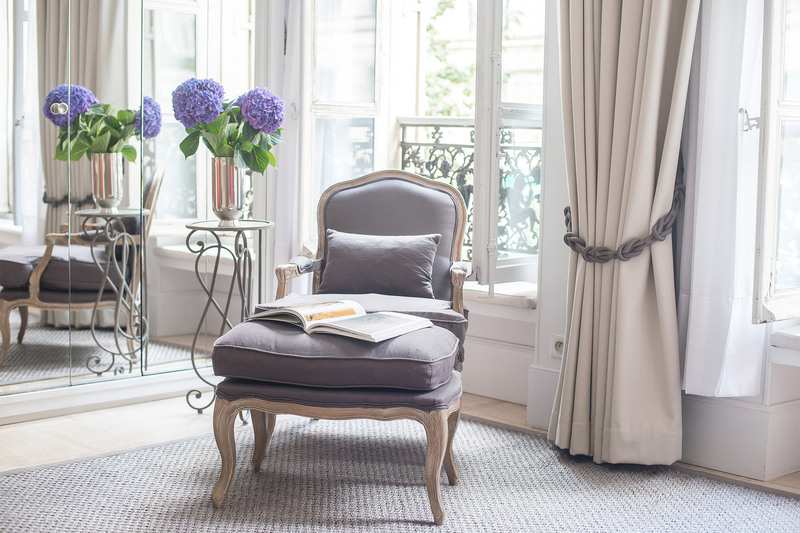 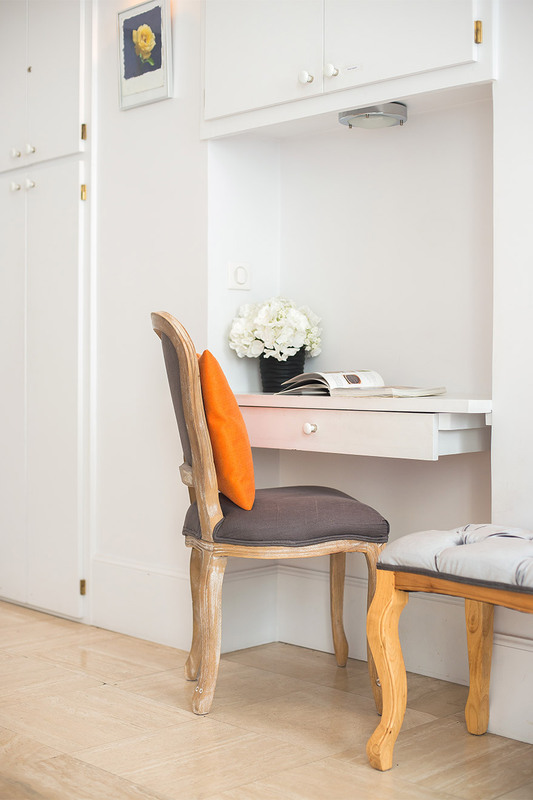 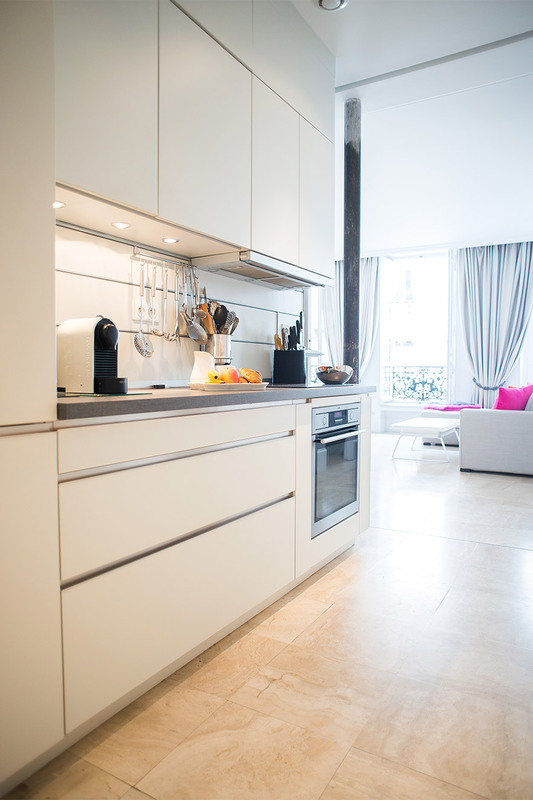 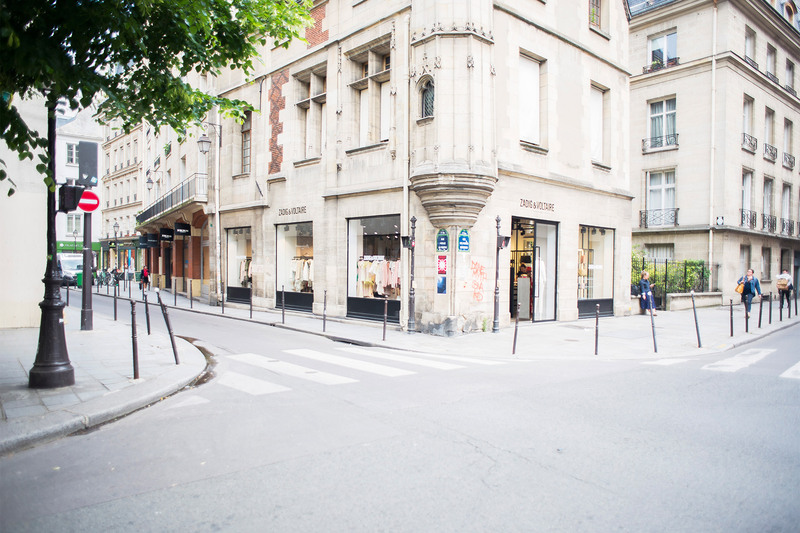 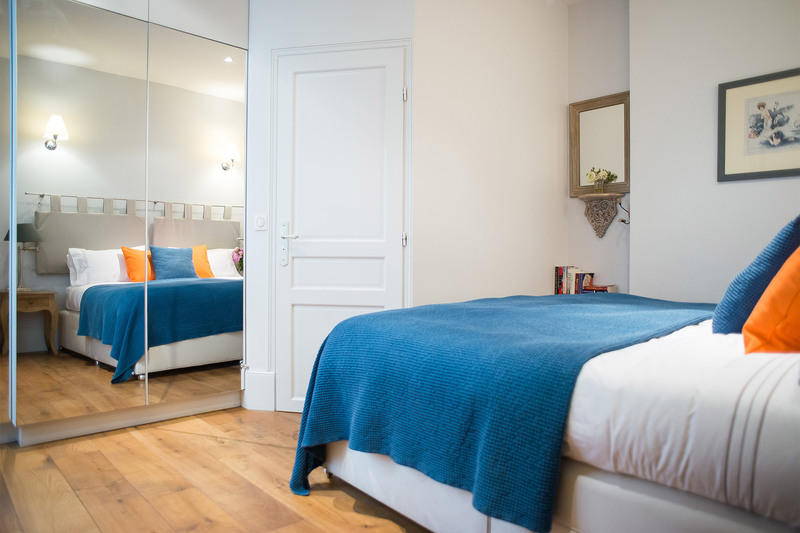 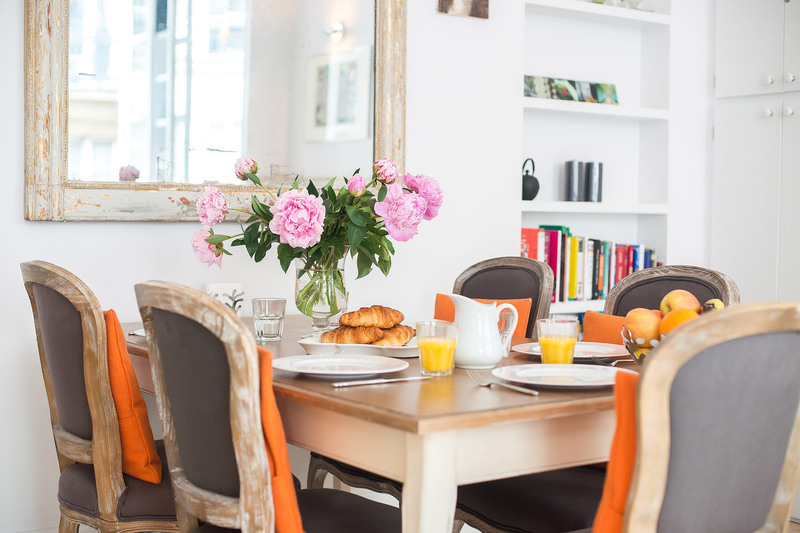 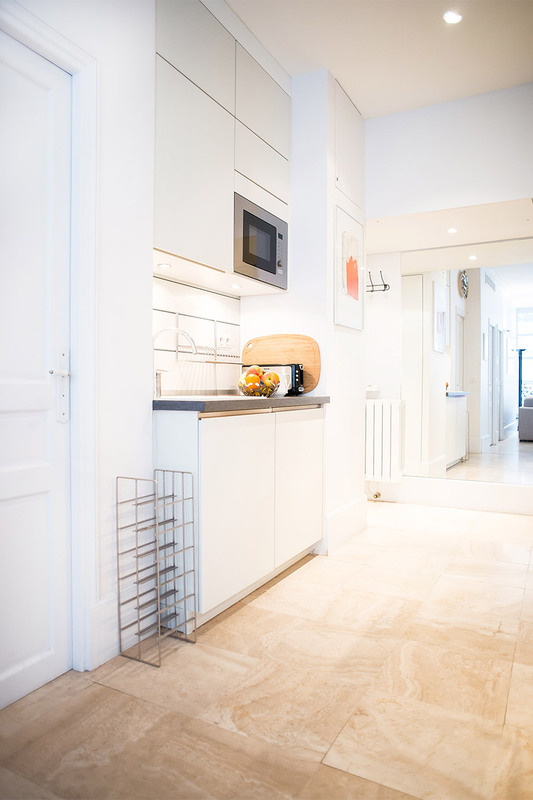 Book this Paris Perfect holiday apartment in the Marais and you'll step outside every morning onto a fabulous shopping street just minutes from the iconic Pompidou center. 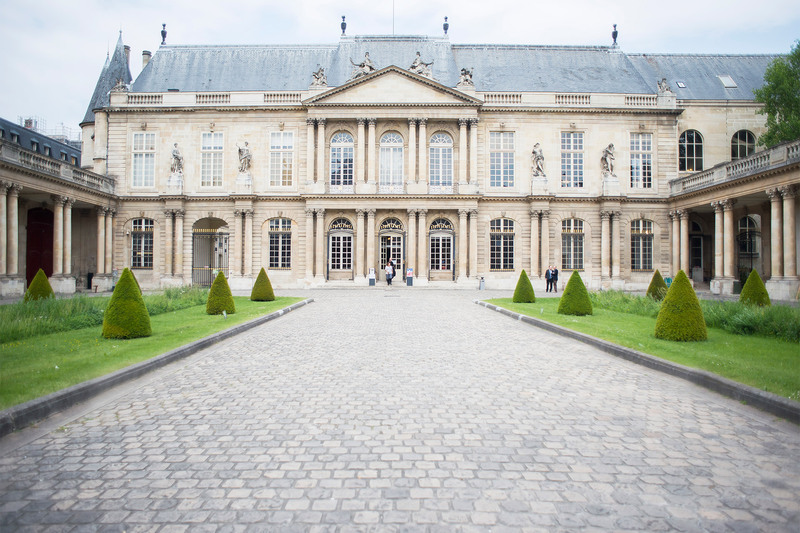 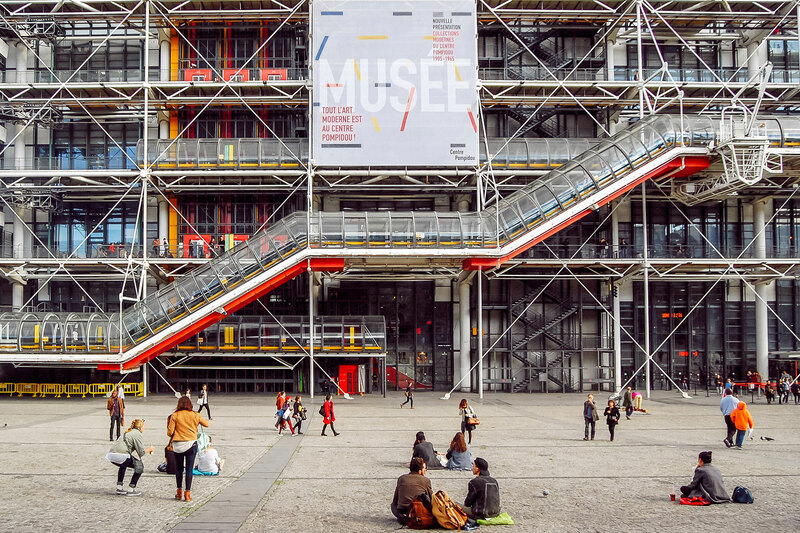 For art lovers, spend time visiting the Pompidou and other top museums in the Marais like the Picasso Museum and the Musée Carnavalet dedicated to the history of Paris. 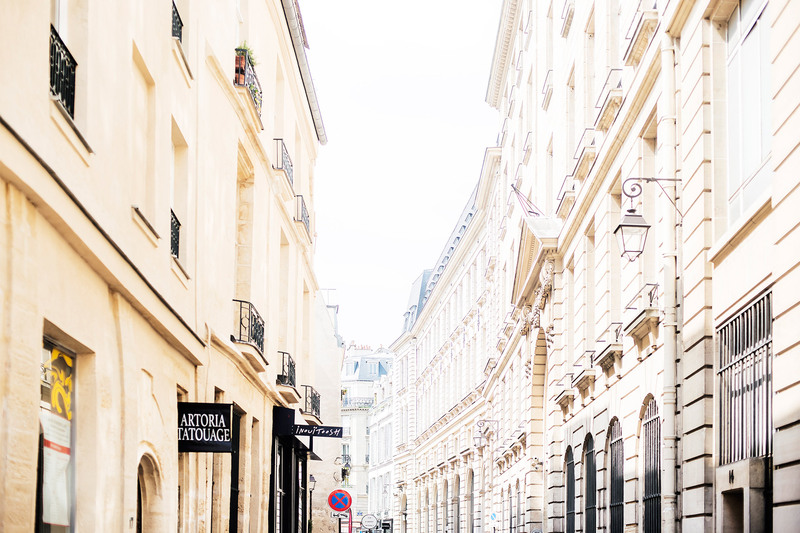 Stroll to the Seine and cross over to the islands to visit beautiful spots like Place Dauphine and the famous Notre Dame Cathedral. 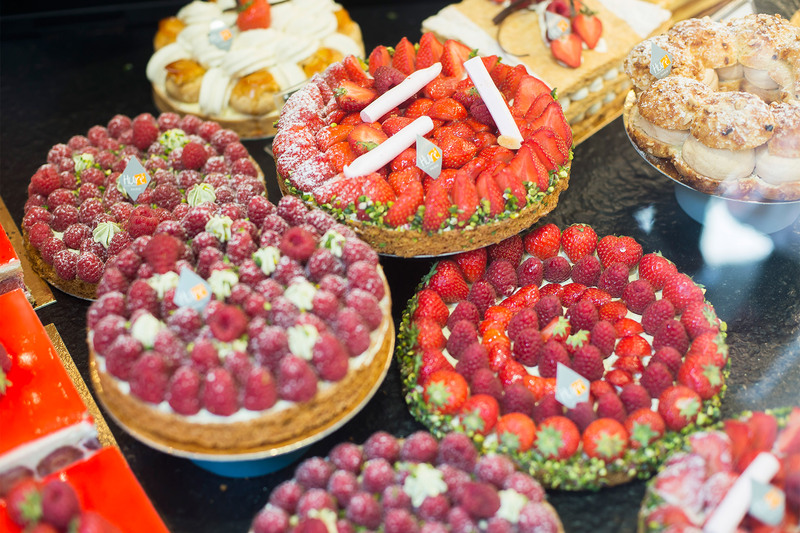 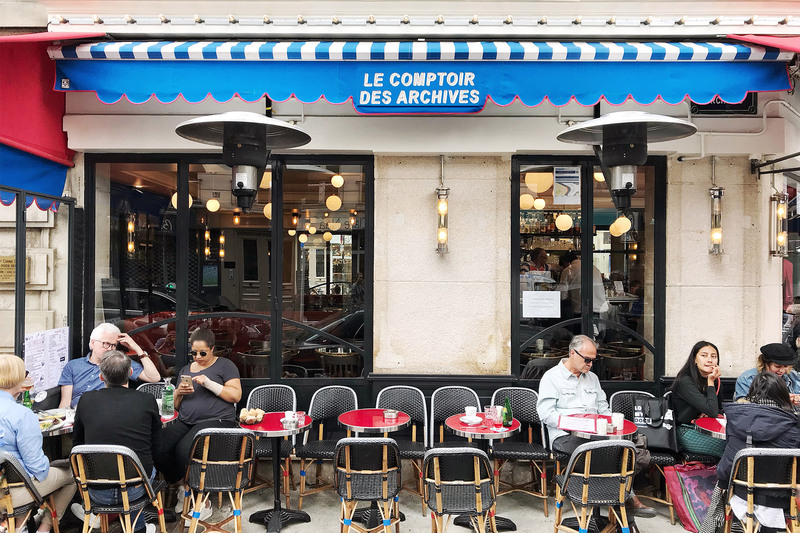 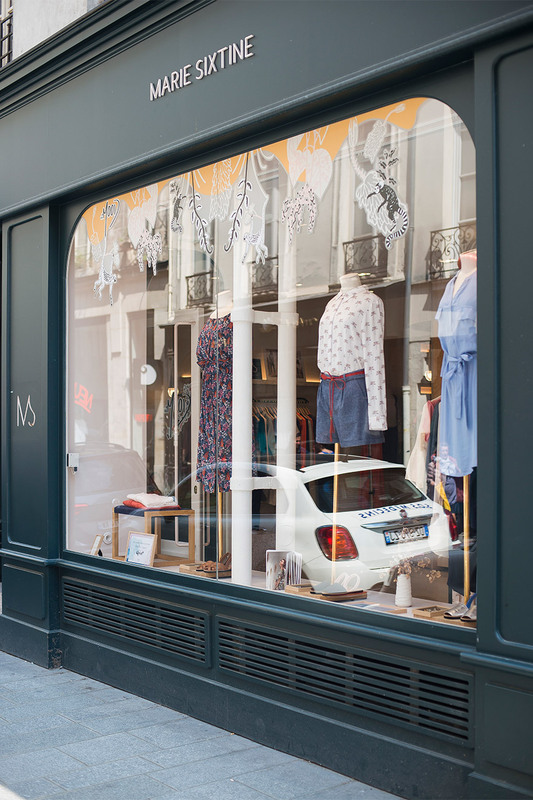 Or meander through the charming streets of the Marais discovering hidden squares, cute boutiques and cafés along the way. 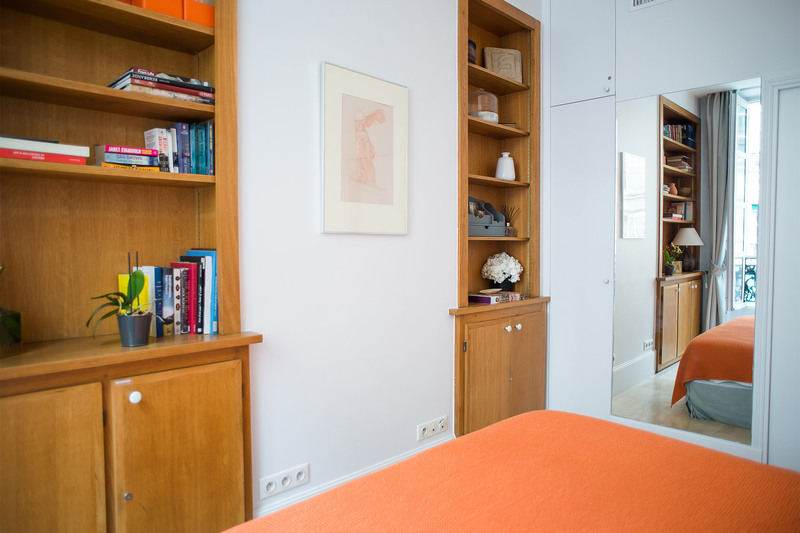 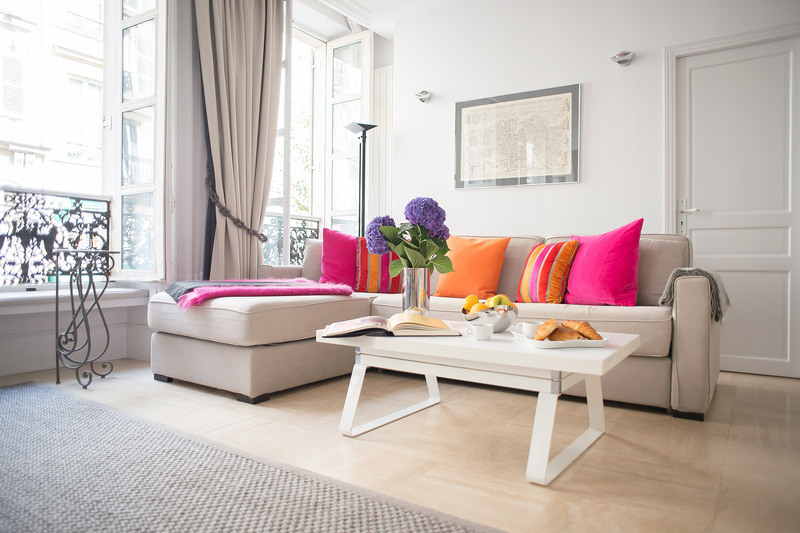 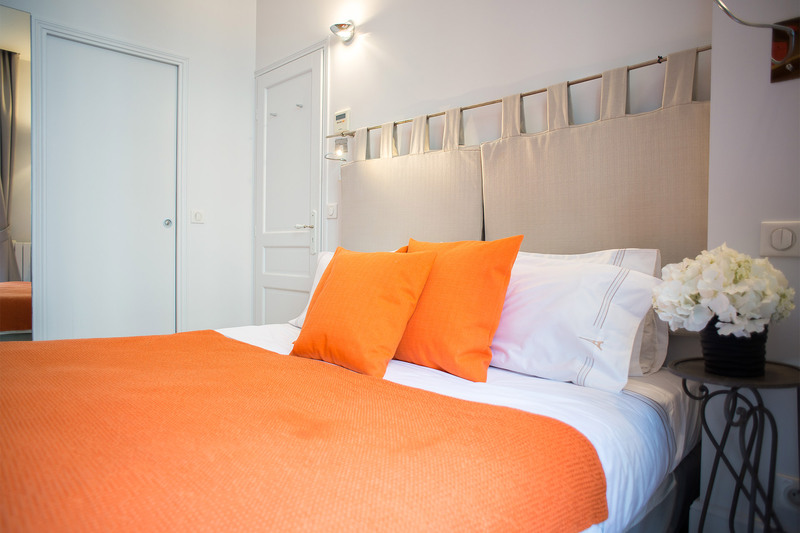 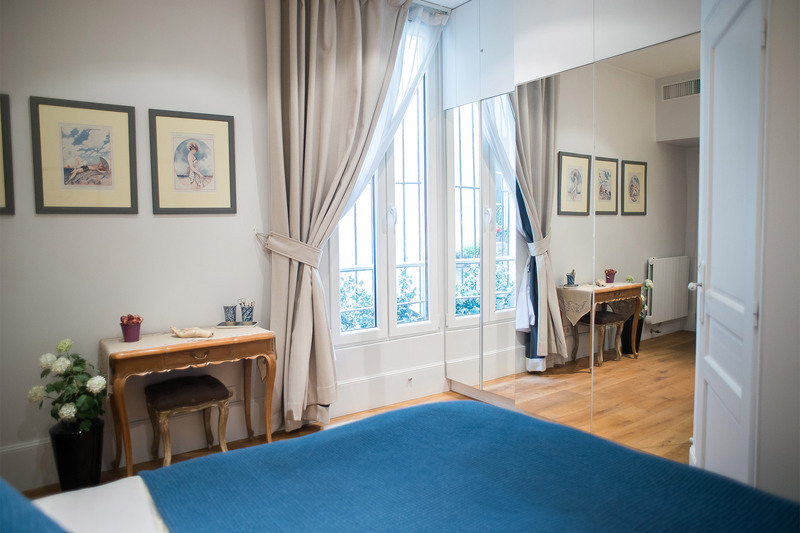 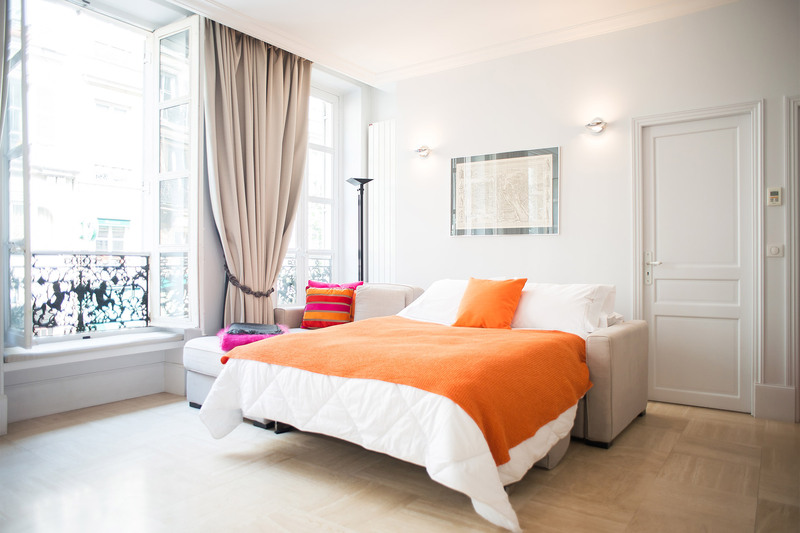 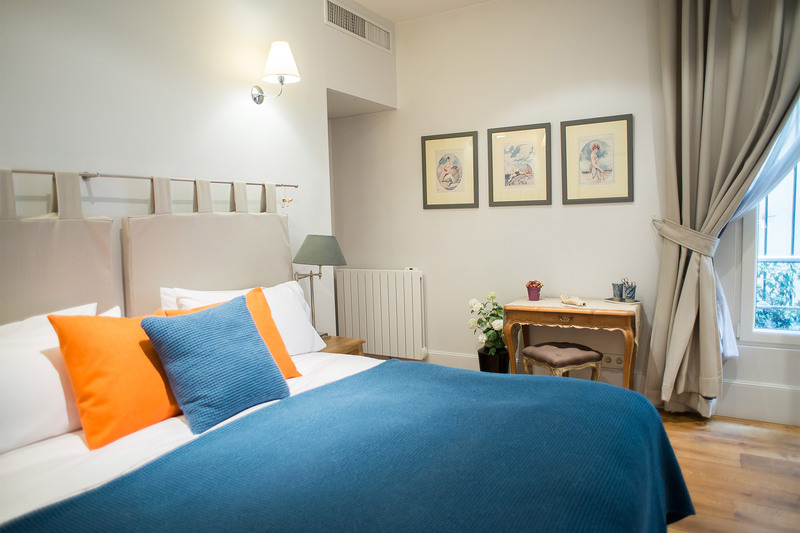 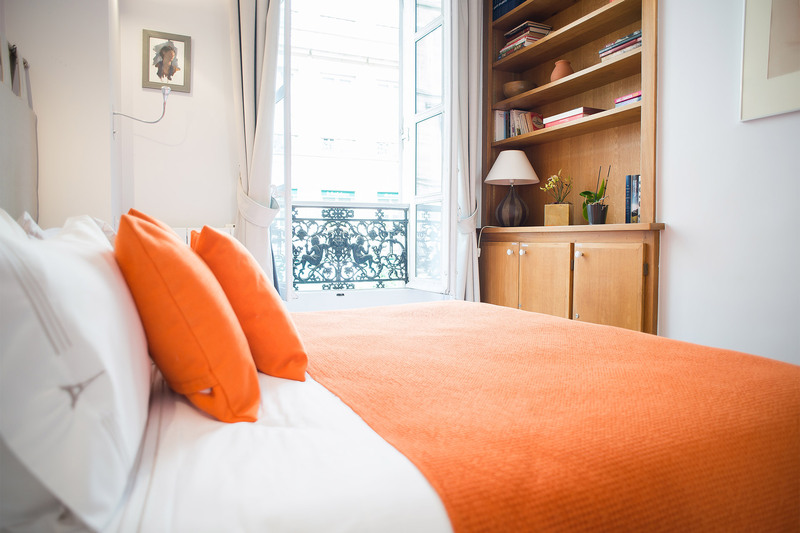 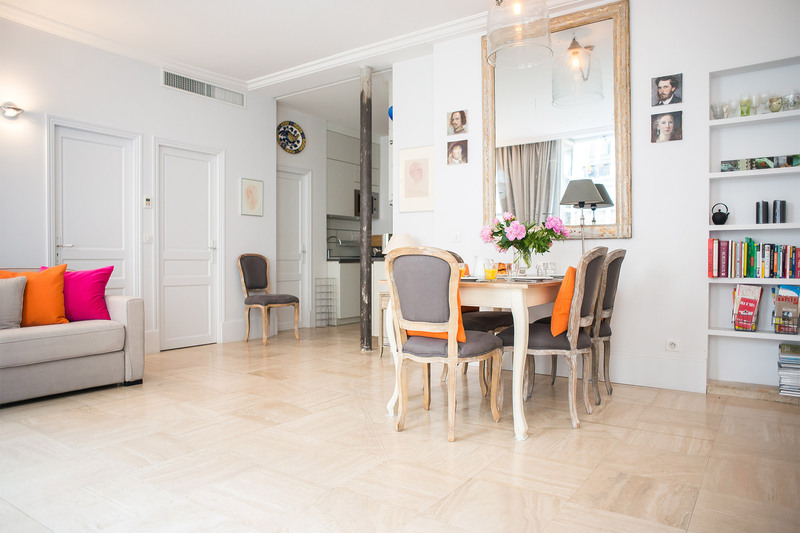 Guests love the comfort and ideal location of the Bel-Air apartment in Paris! 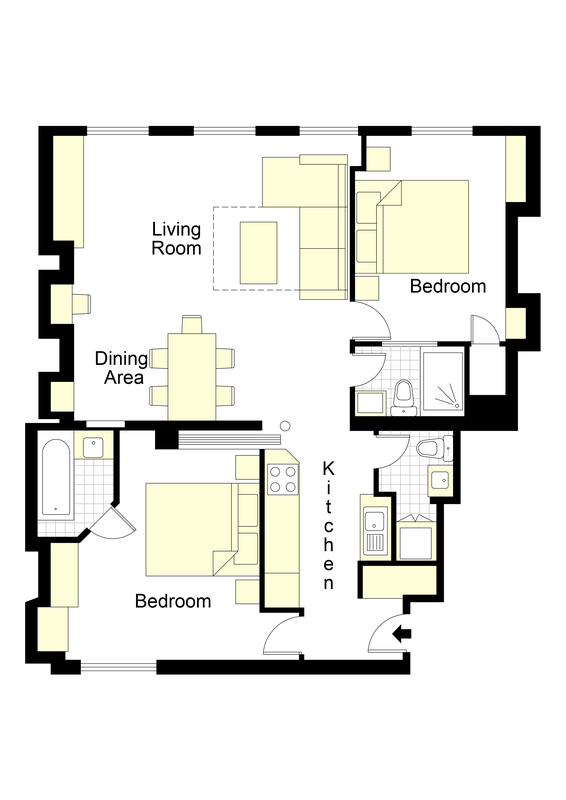 Elevator: Yes, Apartment is located on the 1st floor (2nd floor American). 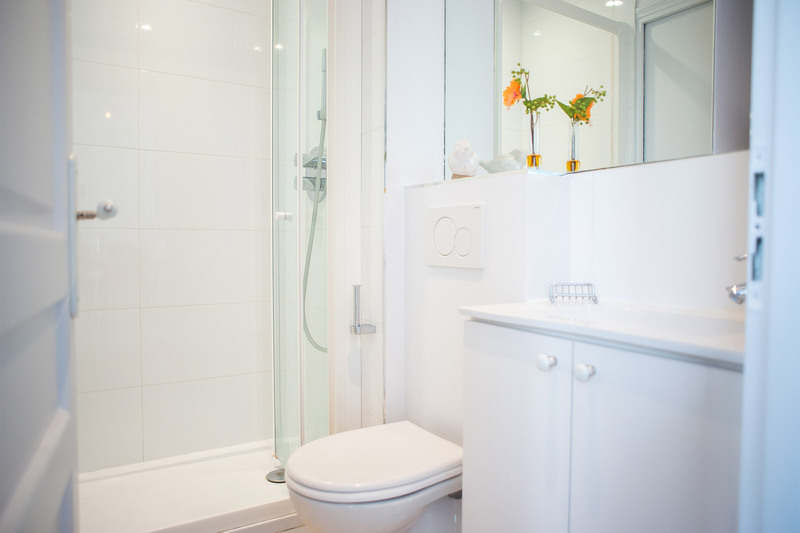 Please note that there are 2 steps from the ground floor to the elevator. 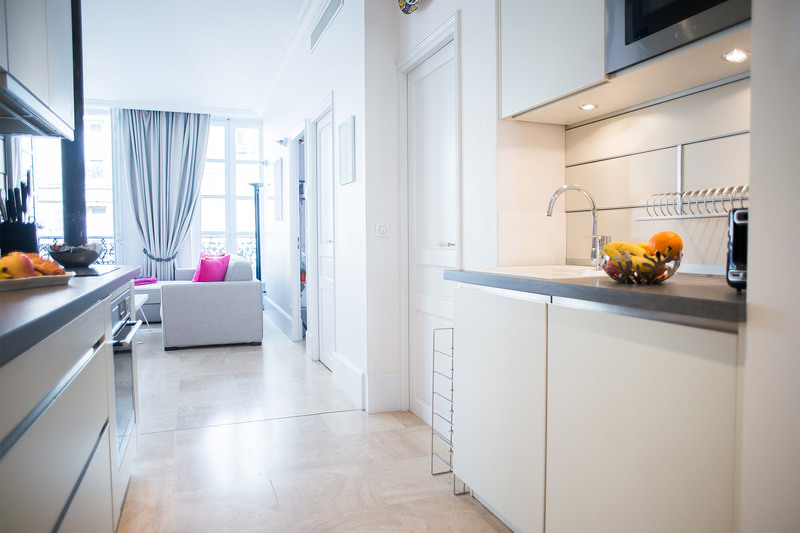 Air Conditioning: central air conditioning throughout the whole apartment. 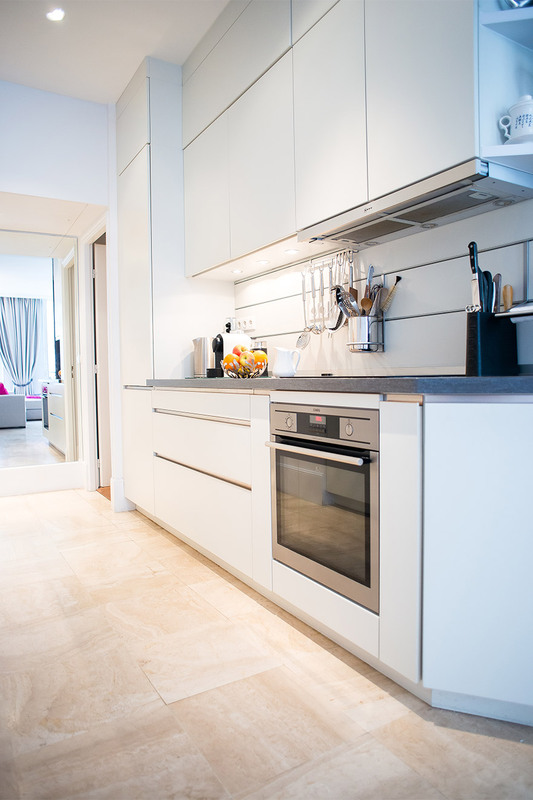 Heating: central heating throughout the apartment. 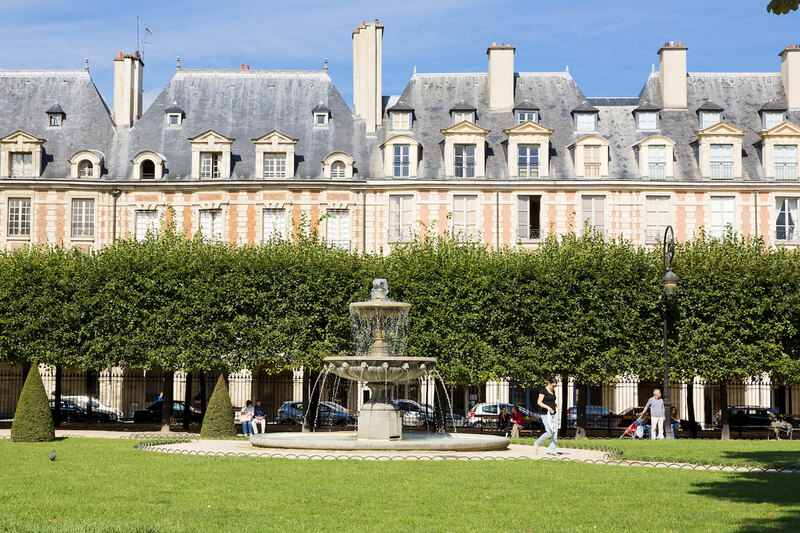 Public Transport: Metro Rambuteau (line11), Hôtel de Ville (line 1 and Line 11) and Etienne-Marcel (line 4). 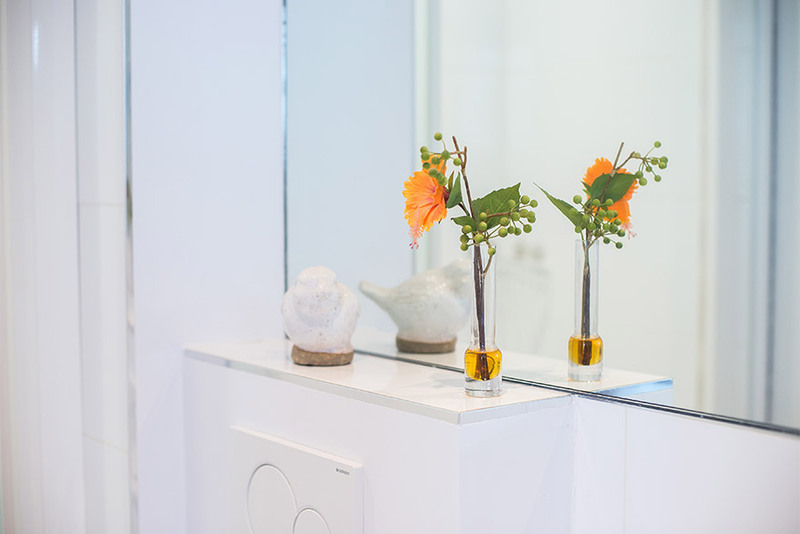 We hope you had a wonderful stay in our Bel-Air apartment. 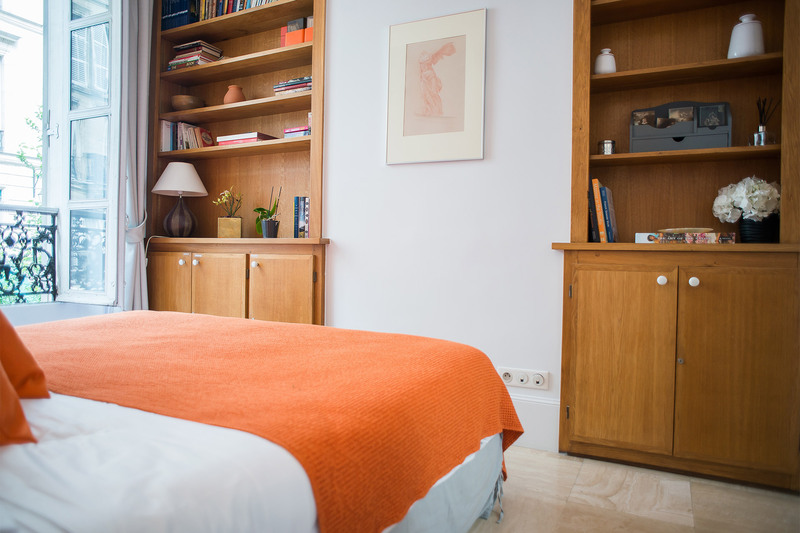 Please take a moment and click here to share a review of your experience with us. 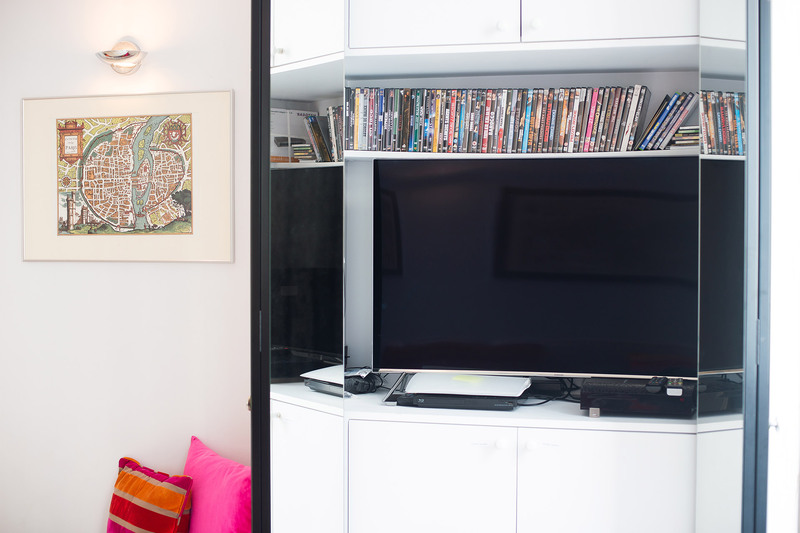 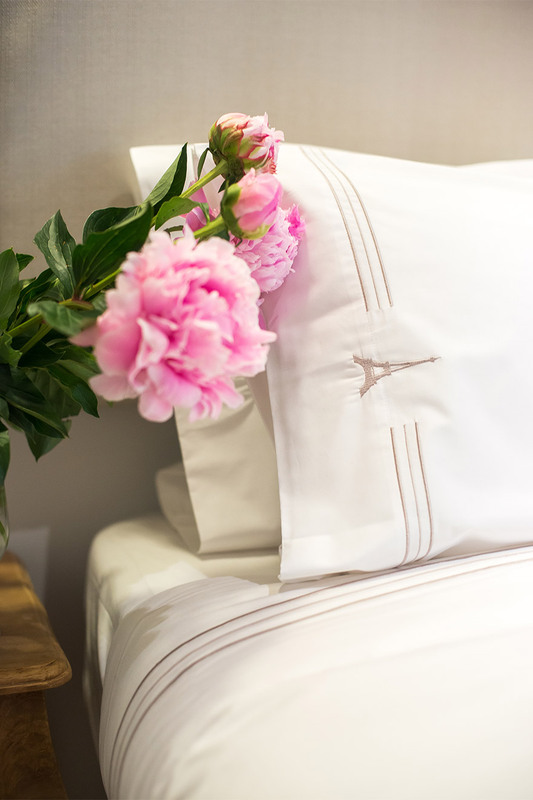 Be one of the first to stay in our Bel-Air apartment and submit a review. 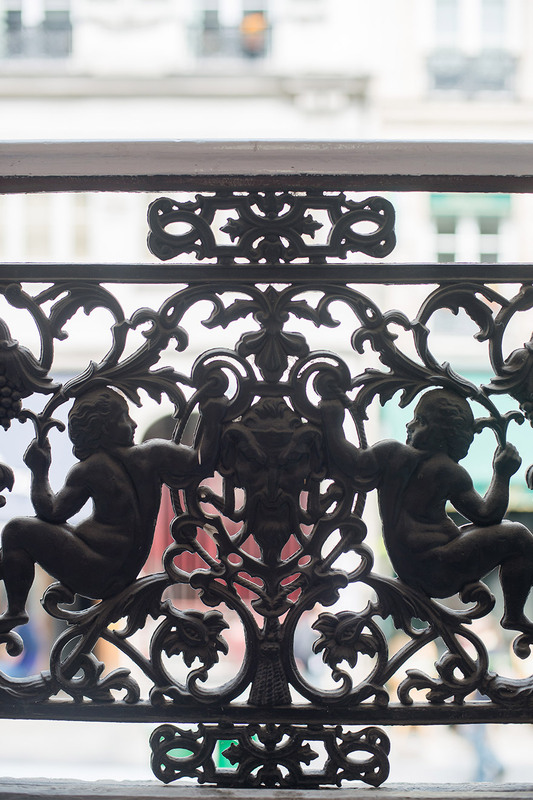 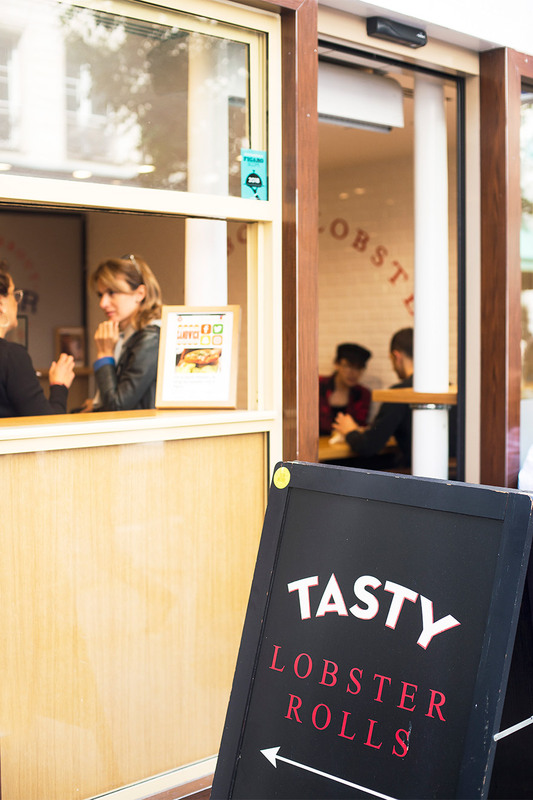 Click here to make a reservation! 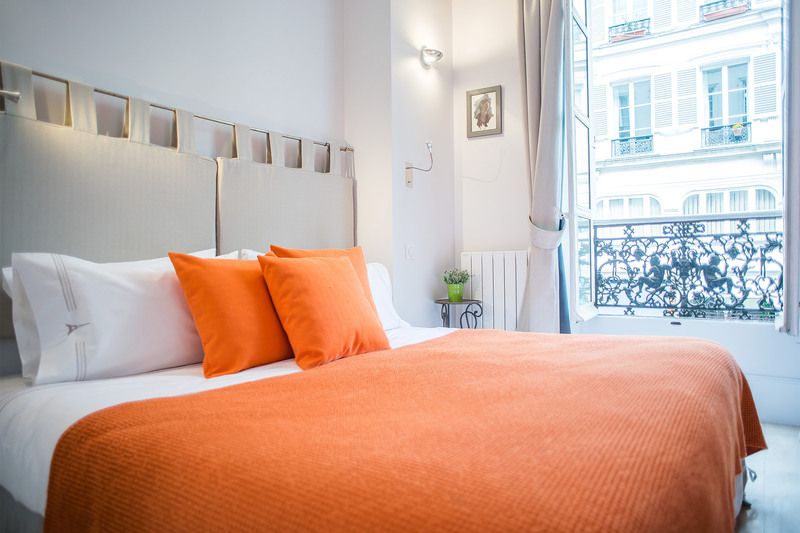 Located in the heart of the Marais, just minites from the famous Pompidou Center and fantastic shopping and dining areas. 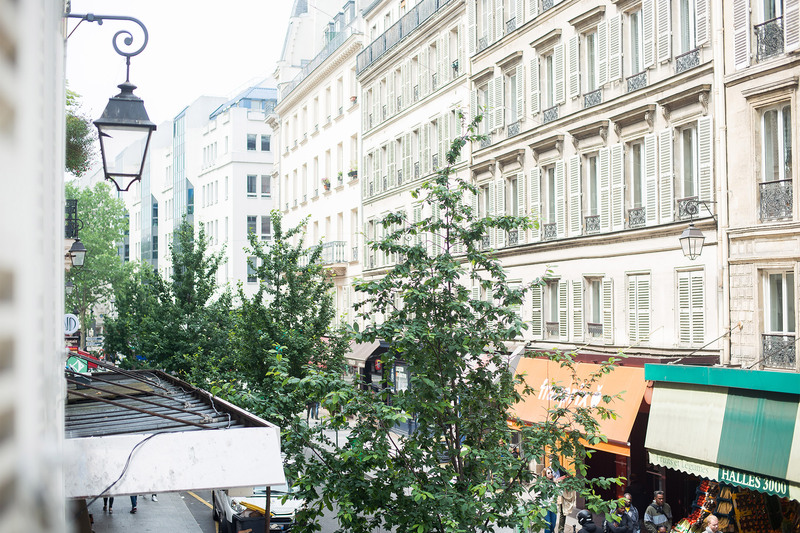 Métro: Rambuteau on the Line 11 (2 min walk), Hôtel de Ville on the Line 1 and Line 11 (6 min walk) and Étienne-Marcel on the Line 4 (8 min walk).